The details make the difference. Whether it's the traditional details—cuffs, pockets, darts, etc.—or the myriad alternative details that fashion designers are using today, these eye-catching, trend-setting elements are what make their designs stand out on the runway and on the street. 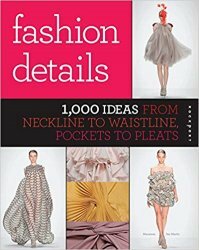 A vast and complete reference to the integral elements of fashion design, Fashion Details features thousands of full-color photographs showcasing the works of designers from around the world, including Camilla Norrback, Georgia Hardinge, Elisa Palomino, Stas Lopatkin, and many others. Re-energize your current designs and be inspired to take your next designs in a completely new direction. This sourcebook of inspiration and motivation must be in the arsenal of every fashion designer who has obsessed over and is obsessed with details—professionals and students alike.